Carton and each-pick meets versatility and efficiency. Carton flow storage for pallet racking is a gravity-fed case or each-pick system ideal for accessing multiple SKU pick slots per bay. 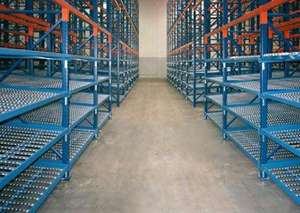 Rear loading keeps pick aisles free for more efficient order processing. Cartons are fed into the storage lanes and flow on inclined rollers to the opposite aisle for full and split-case picking. Systems designed by E-Distribution can be used as stand-alone or integrated with conveyor, pick-to-light and multi-level pick modules. 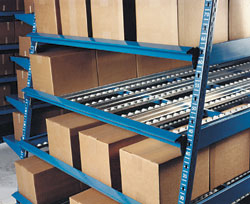 Perfect for material handling applications with numerous or slower moving SKUs using a FIFO product rotation. E-Distribution will run a SKU analysis to develop a case flow layout and slotting options specific to your operation.